The Sohma family is large and extensive, and the timeline of Fruits Basket is the first time that all the zodiac spirits are present and posessing different family members. While all the zodiac members know each other, this isn't to say that they all know each other well or that they're all equally important in the story - in fact, some of them barely show up at all! Regardless, there are a few members (other than Kyo, Akito, and Ayame) that are worth highlighting due to their significance in Yuki's life. The first and foremost is Hatsuharu Sohma (more commonly simply called "Haru"), posessed by the ox spirit of the zodiac. A year younger than Yuki, he's generally a pretty easygoing guy. However, just like he has black and white hair in accordance with his animal, his personality has two sides as well: normal Haru is "white" Haru, but then he can turn into an irritable, snappish "black" Haru. Very early on in the series, Haru tells Tohru that his "first love" was actually Yuki, much to her surprise. Whether he's serious about being romantically interested in Yuki or not is unclear, but he does care immensely about Yuki, being concerned for his physical and emotional wellbeing. (In fact, at the end of the series, he tells Yuki he'll always find him pretty despite being in the presence of his girlfriend Isuzu, or Rin, the beautiful and temperamental horse.) However, this wasn't always the case. According to the zodiac story, the rat rode on the back of the ox to reach the banquet, and thus Haru hated him. Other family members would poke fun at Haru, saying that the ox was dumb for being used by the rat, and though he knew they were joking, was still irritated by it. Haru would then blame his lack of self-confidence on Yuki despite never talking to him, and one time actually ran into Yuki, ranting at him about how it was all his fault he was laughed at and thought to be dumb. Chapter 13 Yuki: Is that really how it is? Are you really "stupid"? Haru: I'm not stupid at all, so don't rush to conclusions. Don't judge me. Don't laugh at me. Yuki: Yeah ... I understand. In this way, Yuki was one of the few people to withhold judgment solely based on his zodiac animal, and through this, Haru was able to resolve his hatred for Yuki, discovering to be totally different than his image of him. The Haru we see throughout the series cares and worries so much for Yuki, prodding his relationships with others forward, knowing how it's incredibly important for Yuki to have them. Haru was the one to beg Shigure to let Yuki stay with him instead of living at the main house (promising to call Shigure "sensei" even though he was kidding), to convince Tohru to call him by his first name, to encourage his efforts with the student council. He even tries to get Yuki to call Tohru by her first name - something that he's too embarrassed to do. In the context of Haru, it's also worth mentioning young Kisa Sohma, the tiger of the zodiac. When she arrives at Shigure's residence, scared and mute, Haru is constantly around the house, trying to get her to open up. In the end, with Yuki's encouragement, as well as everyone else's warmth and kindness, Kisa opens up, but not before Haru does his share of worrying. Chapter 27 Yuki: You seem to worry about [Kisa] a lot. Have you two always been so close? Ayame and Haru: You jealous? 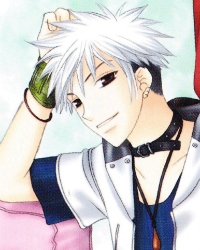 Another semi-important figure in Yuki's life is Shigure Sohma, the dog of the zodiac. Of course, he's important because he allows Yuki to live with him, and they don't really have a very deeply developed relationship other than housemates. The most significant thing said about Shigure is when Yuki expresses his supicious of him and calls him "jellyfish floating on the tide" - Shigure always smiles, but that smile hides what he's truly thinking, and no one can ever know what he's actually planning. The most that can really be said about Shigure and Yuki is that they get along - Shigure, though he appears friendly and silly, actually understands quite deeply all of the zodiac members' issues, even if he's just waiting it out for Tohru to help break the curse. The last one that I feel is worth mentioning is Hatori Sohma, the best marriage prospect of all the Sohmas - I mean, he's the dragon of the zodiac, taking the form of a seahorse. Hatori is a physician, and also has the ability to erase peoples' memories, which he was forced to do when Yuki was a child and his class found out about his curse. Yuki begged Hatori not to do it, as they were his first friends, but Hatori had no choice, and as a result feels indebted to Yuki. Hatori himself is a bucket full of sob story as well, though quite different from Yuki's. He's also the only person who can control Ayame, and is the person Ayame gleefully reports to whenever Yuki shows any sign of "affection" to him. As Yuki changes through the story, he comes to terms with what happened and doesn't blame him. Chapter 95 Yuki: I also wanted to apologize to you, Hatori. For what happened when I was little. Somewhere in my heart I may have been blaming you all this time. I'm sorry. I was just a child. And you were hurting too, Hatori. Hatori: Never mind me. There's no need for you to apologize. [ruffles Yuki's hair affectionately] You are very kind ... Thank you. Don't be like your brother. Yuki: I won't. And I can't.